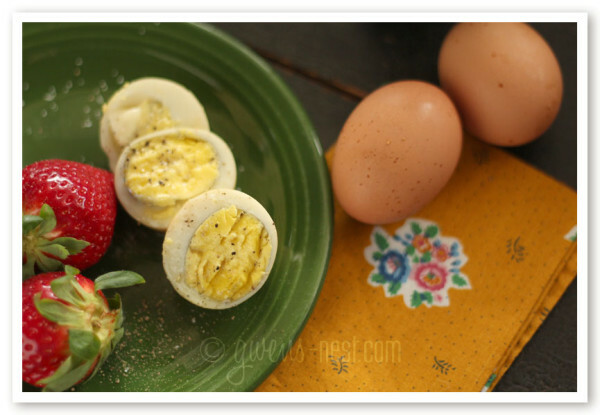 My favorite hard boiled egg recipe is SO simple that it doesn’t even require any water. Technically, it’s not even boiling, but it IS hard cooking. 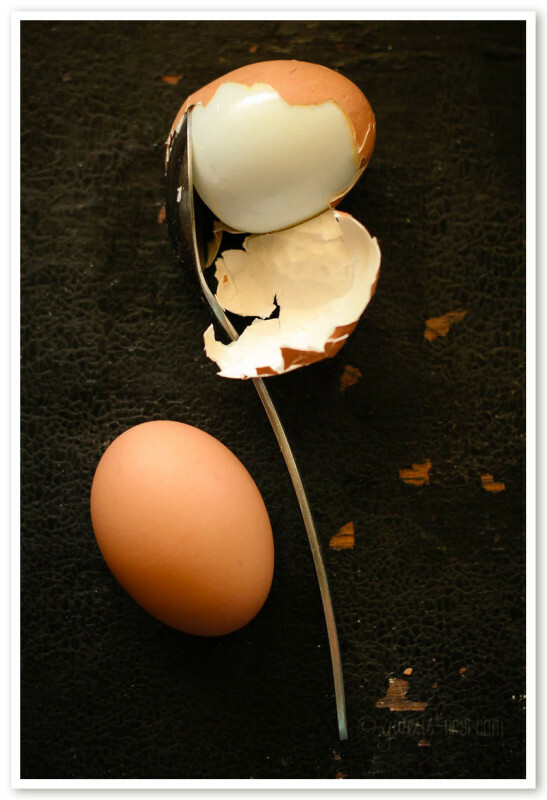 The end results are the same- a delicious hard cooked egg, but the peeling process is way, way easier! 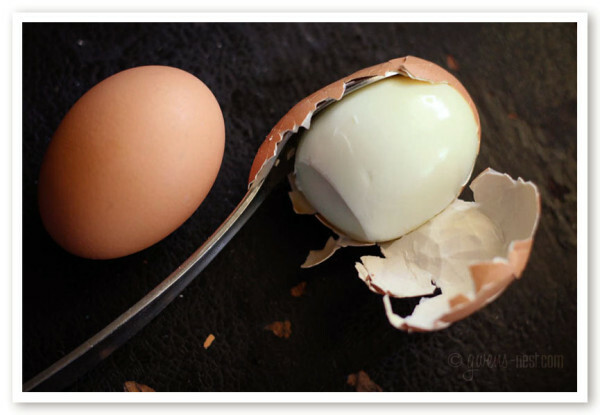 If you’ve ever struggled with peeling fresh eggs, then try this method. Bake for 30 minutes, and place finished cooked eggs in a bowl full of cool water to bring the temp down so they’re cool enough to peel. To make peeling super simple, you can tap & then roll to crack the shell, and then I like to slip a teaspoon just under the membrane and the egg slips out easily. Crack the shell all over. Find the hollow end, and slip a teaspoon into it, working it just under the membrane. Slide the spoon up the side of the egg, and the shell will pop right off. Easy peasy! 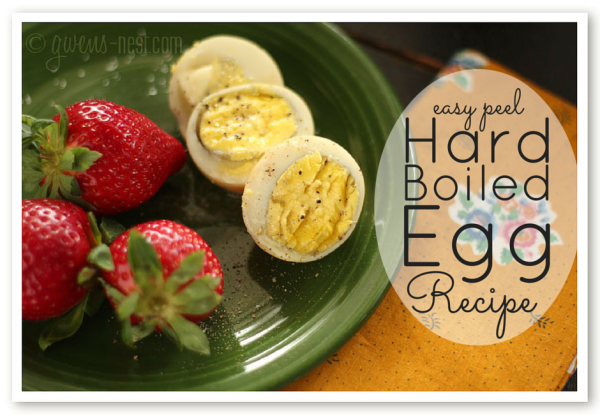 Here’s your printable (better than) hard boiled egg recipe! You really can't get any easier than this simple recipe for producing perfect hard cooked eggs. No boiling water necessary! 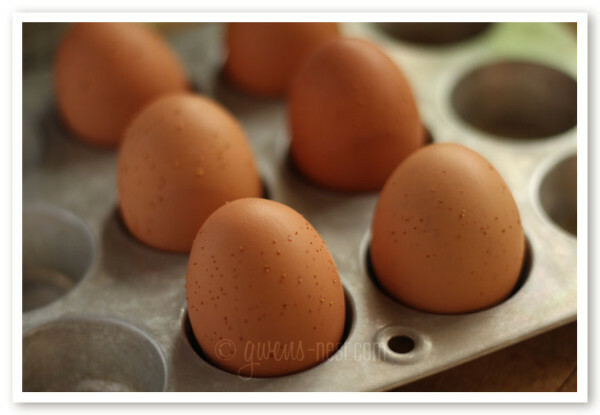 Place eggs into mini muffin tins to keep them stable while baking. Place cooked eggs into a bowl of cold water to bring temp down before peeling. 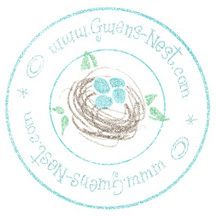 Note: It's normal to have brown spots show up on the egg as it cooks. They rinse off in the water bath, and don't affect the taste or finished product at all. Thank you! I have so much trouble with hard boiled eggs! The mini muffin tin is a great idea, too! Can’t want to try this! Seriously, my son LOVES to make “Heaven’ Eggs (Deviled eggs without the enemy being glorified!!) Do the yokes work well when cooked this way?? Thanks for your neat, innovative, and time-saving/labor-saving ideas!! My mini muffin tin has 24 cells. If I only want to make a dozen, do I just leave the rest empty or…? Can you use eggs straight from the fridge, or do they need to be room temperature? Thanks! I use a light aluminum pan, and I don’t have the dark spots. I’d try it with a lighter pan, and less time in the oven. They shouldn’t be cracking open like that. I’m sorry about that! I do mine in the electric pressure cooker. Cover with water Cook for 6 minutes. Release pressure and cool. Peel like a dream.